I've been doing long exposures at night for over 40-years. I started using Kodachrome 64 and then Ektachrome 160 pushed to 1000 ASA. 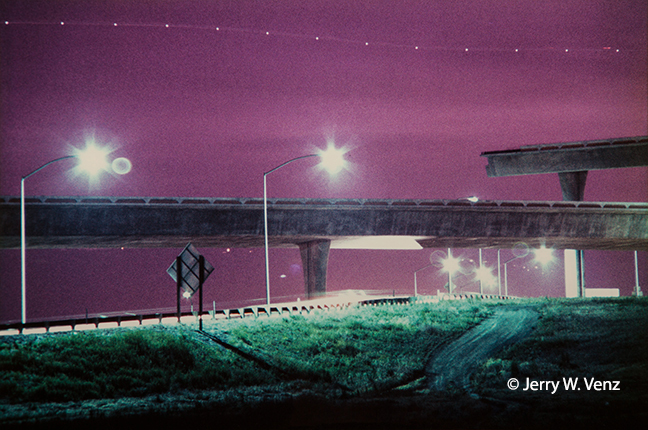 The image below is an example using Kodachrome 64 with a 30 second exposure at night. 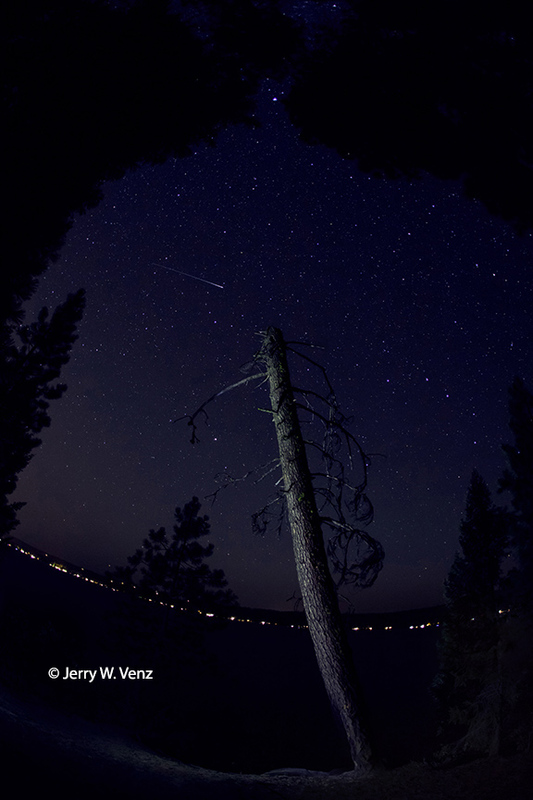 Painted tree during Persied Meteor Shower with Canon 5D MK II, Canon 15mm fisheye lens @ f2.8 for 20 seconds at 3200 ISO. What made this image was getting the lights of the small airplane passing through the frame. This was not a lucky accident as there is a large busy airport only a mile away. I was set-up, with my tripod, waiting for a plane to pass through this field of view. The purple sky is a natural result of using the daylight balanced Kodachrome after sunset--again, no accident, this was the result I wanted. This is what we did to create radically different views of the world before digital and Photoshop. So, let's jump forward to the present century…current technology has made these unusual views of the world commonplace, so as an artist, I'm always looking to try new things on different subjects. This next image was created during a week long camping trip to McCall, Idaho at the Ponderosa State Park. My goal was to capture a starry night scene with some meteors in the sky and a light painted object, of some kind, in the foreground. I know that's a pretty ambitious undertaking for my first ever outdoor light painted--star field image…but what the heck I knew I would learn something !!! On my second day there I discovered this great, leaning, dead tree at the edge of the lake. It was perfect since it's position there gave me a big patch of sky behind it. McCall Milky Way with Canon 5D MK II, Canon 15mm fisheye lens @ f2.8 for 30 seconds at 3200 ISO. 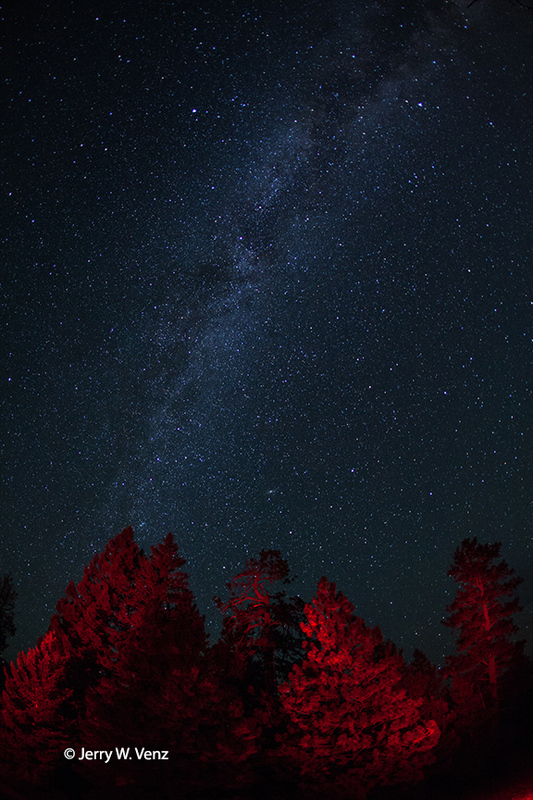 This next image was done the following year at the Ponderosa State Park, but in a much darker area where I could avoid any light pollution. The timing was right, as well, and since there was no moon, I wanted to do a Milky Way image the something light painted in the foreground. Even with the 15mm fisheye's 180 º field if view I still had the camera pointed nearly straight up to get the Milky Way and just the tops of the trees in the foreground. On this trip I had two assistants, that I quickly trained, to light paint from each side of the frame with the Red LED flashlights. As usual, the light painting was the hard part--getting the Milky Way was easy! It's very difficult, even dangerous, walking around in these pitch black locations especially when there's no moon! So, walk carefully. At this location the spot I picked was on a slope and covered with loose rocks and small boulders. Even with their flashlights my friends had a difficult time making it back to camera position to view the results. However, we succeeded in getting this image after only 5 attempts. The only thing I've done, so far, to the RAW file is dial down the color temperature to 3400º K, to bring some blue into the Milky Way, that I think enhances the image. Next week I will be posting some tips on the technical issues of creating starry night skies without star trails. As usual, if you have questions don't hesitate to ask.